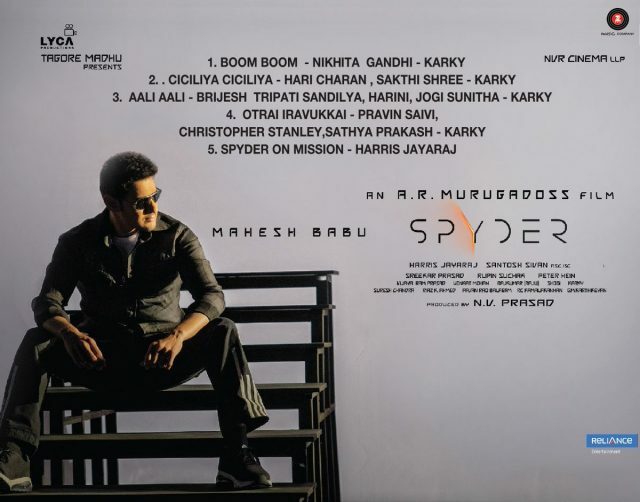 The tracklist of ‘Spyder is out and it suggests that this Mahesh Babu starrer will be a treat for music lovers. If you are a fan of the much-loved and highly talented Mahesh Babu then we have some good news in store for you. In an exciting development, the makers of his ‘Spyder’ have released its official tracklist and made the wait for the film even more difficult. The tracklist features five numbers and indicates that the audio of Spyder is going to be an absolute delight for music lovers. Nikhita Gandi, Pravin Saivi and Karky are some of the singers associated with this Harris Jayaraj musical. Interestingly, the audio of ‘Spyder will be launched today at a star-studded event in Chennai. SS Rajamouli and S Shankar are likely to serve as chief guests at the event. Tamil star Suriya too may attend the function as he shares a good rapport with director AR Murugadoss. In case you did not know, ‘Spyder’ is touted to be a spy-thriller and has been shot simultaneously in Tamil and Telugu. Besides Mahesh Babu, it also features Rakul Preet in the lead. Sometime ago, the lady had said that she will be seen in a different avatar in the film. On a related note, ‘Spyder’ will be Mahesh Babu’s first release of the year. He was last seen in ‘Brahmotsavam’ which underperformed at the box office.